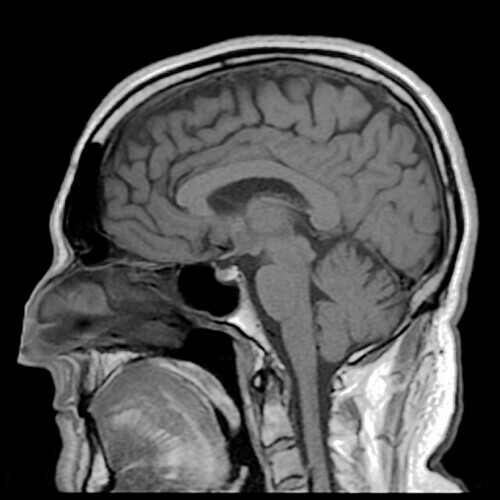 This is one of many Magnetic Resonance Imaging (MRI) shots that were recently taken of my brain. The test was conducted to rule out certain possibilities that might be responsible for an eye problem. The result was "unremarkable", which is medical code for "normal"
The procedure was noisy and confining, but ear plugs were provided and I don't suffer from claustrophobia so I had no problems at all. You just lie still while the machine makes various loud arhythmic 'twanging' noises in the process of capturing the images. Note the sinus cavities above and deep behind my nose, my short stubby tongue and cruelly thin lips, the way my spinal cord expands to become the brain-stem, and the inverted shallow U shaped corpus callosum which surrounds the thalamus and connects the left and right cerebral hemispheres of my brain together. I am in awe that this is the structure that holds the whole of my being, everything that I was, am and will be, all my thoughts, feelings and memories, my entire inner world and every single detail that I know about the outer one. Simply amazing. In fact it is even more amazing if you know that it's just the 3 mm thick outside lining (i.e. the little grey cells) of the cortex that does most of that. Unlike Computed Axial Tomography (CT or CAT) scans, MRI uses no ionizing radiation. Instead a powerful magnetic field aligns the nuclear magnetization of hydrogen atoms in the water of the body. Radio frequency fields are used to systematically alter the alignment of this magnetization, causing the hydrogen nuclei to produce a rotating magnetic field detectable by the scanner. This signal is further manipulated by additional magnetic fields to generate enough information to construct an image of the body. T1, T2, T2*, FLAIR and so on are names of different standard patterns of characteristics of these pulsing fields. Each results in an image that emphasizes a different kind of bone, liquid or tissue structure. This is a T1-weighted sagittal view (from the side; coronal is as seen from the front or back; axial is as seen from the top or bottom) through the mid-line of my head produced in a 1.5 Tesla MRI scanning machine built by GE. I changed the brightness and contrast of the raw (DICOM format) image to better show the details I wanted to show, and also resized it using The GIMP, a photo editing program.